This remarkable device, the modem (from MOdulator—DEModulator) heralded a new age of communications and played a major role in the explosion of the internet. Modems were in action in teletype services since the 1920s. To send telegrams and cablegrams via teletype, the serial RS-232 standard was developed and used for teletype machines which could communicate with each other over phone lines. Each teletype would be physically connected to its modem (working on 110 bps) via an RS-232 connection and the modems could call each other to establish a remote connection between the teletypes. What one typed at a teletype (or had saved on punched paper tape) could be printed on a remote teletype located far away. No computer was involved. 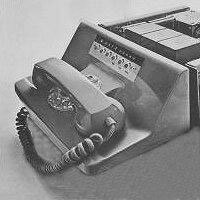 In 1940 George Stibitz connected a New Hampshire teletype to a computer in New York by phone lines and developed further the idea of remote, multiple access to a computer. When the US Air Force needed a convenient way of transmitting hundreds of radar images to command centers during the Cold War in the end of 1940s, they turned to the telephone system and modems as a solution. Thus in 1949 the group of John (Jack) V. Harrington (1919-2009) at the Air Force Cambridge Research Center (AFCRC) near Boston developed a device for transmitting radar signals, modulating digital data into sounds, and demodulating received sounds into digital data. It was the first telephone-line modem. In 1950s the old 110 bps modem was enhanced by Bell Laboratories (division of the US company AT&T) to improve upon the Teletype speed of approximately 150 bits per second (bps) (see the upper image). 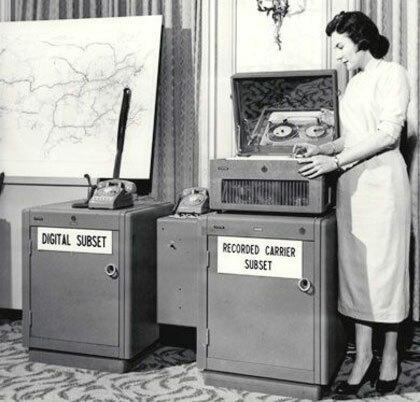 In 1960 AT&T came out with a 300 bps modem (for use on it's phone system), and in 1962 it started selling Bell 103 modems to the public (see the nearby image). Such slow and expensive modems were later mainly used for transmitting data between mainframe computers or for connecting a dumb terminal to a mainframe computer over phone lines. Many dumb terminals didn't even have a screen display, but printed on paper what you typed at the keyboard along with responses from the computer. 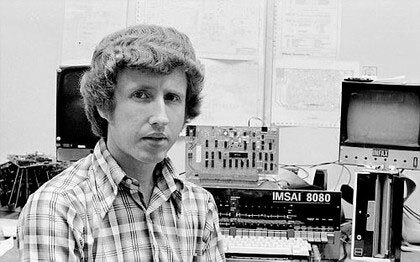 The first PC modem (80-103A) was created in 1977, by Dale Heatherington and Dennis Hayes (see the lower image). 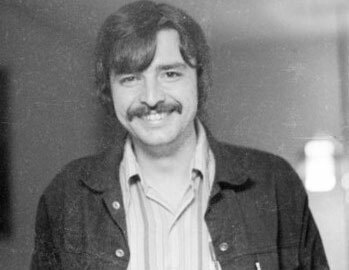 Dennis Hayes (born 1950) met Dale Heatherington (born 1948) at National Data Corporation, when he worked after concluding his studies at Georgia Institute of Technology. One day, over lunch, sitting once on a dining room table in Hayes' home, Dennis and Dale decided to start a company—Hayes Associates, with a modest $5000 investment and this boot-strapped company will become the leader in the industry. They drew out on paper napkins his idea to provide a way for the earliest microcomputers to communicate with other computers via telephone lines. The first products were modem boards for the S-100 bus, then for the Apple II computers, which were sold to computer hobbyists in April of 1977. Solving the interface problems to allow any computer using a standard serial port to control the modem functions with software, they invented the Hayes Standard AT command set, introducing the first PC modem in June 1981. During the 1980s and 1990s, Hayes was a premium brand with a reputation for high compatibility and reliability. At its peak, its market share was some 50 percent, and computer magazines encouraged their readers to shy away from any modem that was not Hayes-compatible. Later Hayes, which was one of the strongest brands for 10-20 years, would face financial problems, and in 1990s go out of business. Heatherington retired in 1985, taking $20 million for his share in the company. Hayes went bankrupt in 1998 and its assets were liquidated. The brand name was purchased and revived by onetime rival Zoom.